Sweet, bright white kernels with a tender-crisp texture grow on 7½-8 in. ears. This early sweet corn hybrid has excellent tip fill, dark green husks and long, attractive flag leaves. It's an excellent choice for market growers and home gardeners. Synergistic hybrids have a very high sugar content, tender-crisp texture and slow conversion of sugars to starches. When planting, isolate from super-sweet (sh2) and normal or high-sugar (su) hybrids. Seeds should be spaced 10-12 in. apart in rows 36 in. apart. For adequate pollination, plant in blocks of at least four rows. Approx. 250 seeds per packet. 72 DAYS. Spacing10-12 inch plant spacing. 36 inch row spacing. Plant in blocks of at least 4 rows for adequate pollination. FoliageAttractive, dark green husks. Long, attractive flag leaves. CommentsExcellent choice for an early season white! 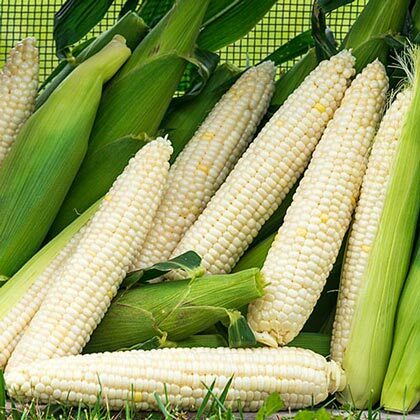 This flavor favorite has delightfully sweet kernels, with a tender, crisp texture. 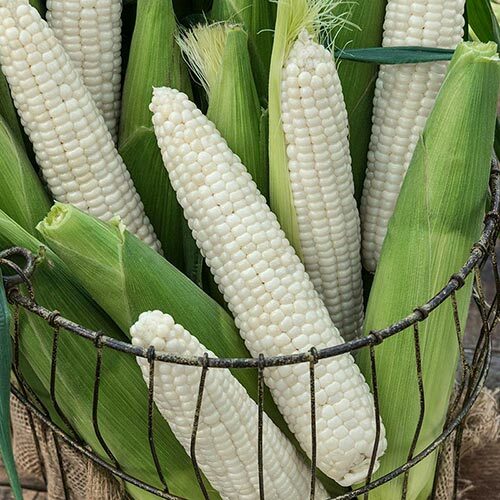 Bright white kernels grow on 7 1/2 - 8-in. ears in 14-16 rows. Excellent tip fill. Handsome, dark green husks. Long, attractive flag leaves.